Jagdish temple was made by Maharana Jagat Singh in 1651. Maharana Jagat Singh ruled Udaipur for 25 years from 1628 to 1653. The temple is dedicated to Lord Vishnu (the preserver of the universe). It is the largest temple in the city. After 28 years of the construction of the temple, Mughal ruler Aurangzeb wanted the temple to get destroyed and sent his army to do so. But the army of Maharana Raj Singh (ruler of Udaipur back then) didn’t let him do so. And so, Jagdish Mandir was saved from getting destroyed. 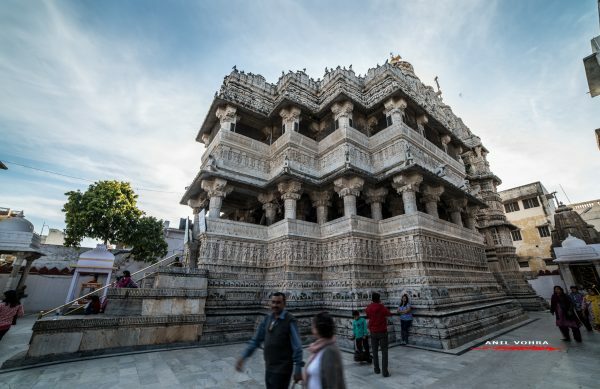 To know more about Jagdish temple, click here. Saheliyon ki Bari can be translated as the courtyard of Maiden in English. It is a major garden of the city. Saheliyon ki Badi was built in the year 1710 by Maharana Sangram Singh for the royal ladies. It was built for a group of forty-eight young women attendants who came with the princess as a part of her dowry. 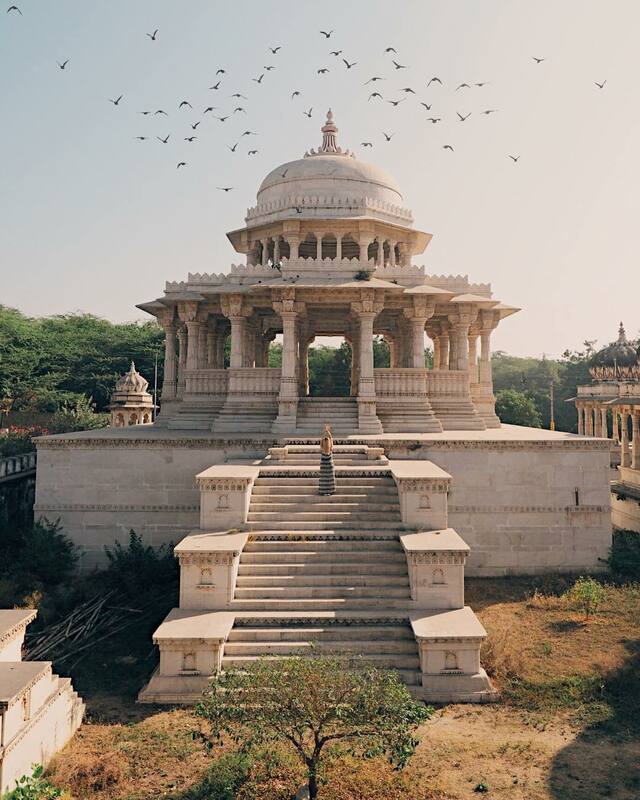 It has beautiful lotus pools, marble pavilions, and elephant-shaped fountains. According to the legend the garden was designed by the king Sangram Singh himself and he presented it to the queen. To know more about Saheliyon ki Bari, click here. City Palace is the palace complex situated on the east bank of Lake Pichola. It was built over a period of 400 years back by Maharana Udai Singh II when he shifted his capital from Chittor district. The palace constantly got addition and modification by other rulers of the dynasty. It is built in both Rajasthani and Mughal architectural styles. It is designed so beautifully that it overlooks several other historical monuments such as Lake Pichola, Jag Mandir, Jagdish Temple, Monsoon Palace, and Neemach Mata temple, and a perfect view of the entire city. To know more about City Palace, click here. 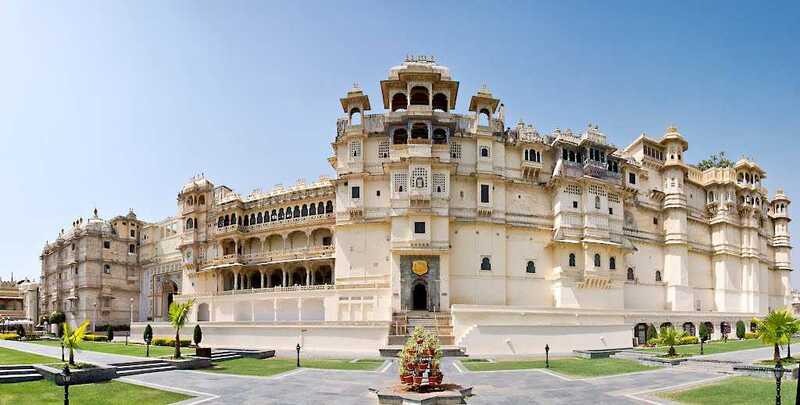 To watch the video of city palace, click here. About at a distance of 3 km, Ahar is called Udaipur’s royal cremation ground. It has a total of 372 cenotaphs of around 19 Maharanas who once ruled the city. This spectacular city of domes was built approx. 400 years back. The most striking cenotaph that you will be able to spot will be of Maharana Sangram Singh and the newest was built in the year 2004 of Udaipur’s last Maharana, Bhagwat Singh. At a distance of just 150 m from Ahar Cenotaphs, you can find Ahar government museum which contains copper and pottery objects of more than around 3300-year-old. 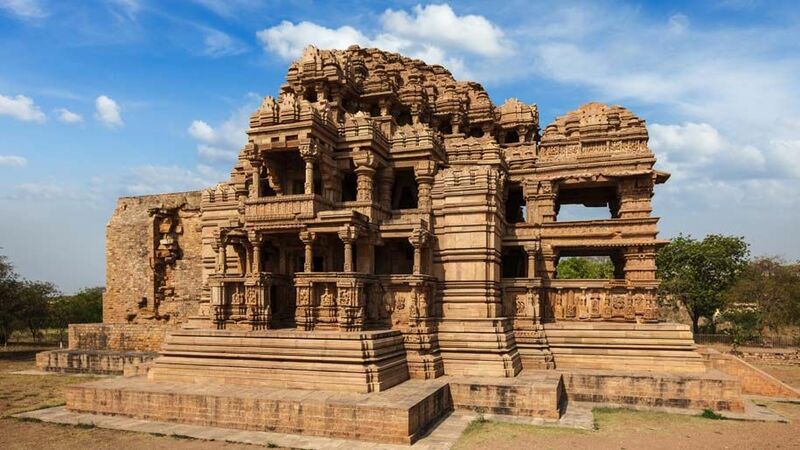 It also has sculptures of Hindu gods and Jain tirthankars from the 8th and 16th century AD. You may also want to read Maharanas of Udaipur. Bagore ki Haveli was built by ‘Shree Amarchand Badwa’ who was the Prime minister of Mewar from 1751 to 1778. He remained at the position throughout the reigns of Maharanas Pratap Singh II, Raj Singh II, Ari Singh, and Hamir Singh respectively. After the death of Amarchand, the Haveli was occupied by Nath Singh, a relative of Maharana back then. The property remained in the possession of Mewar state until 1947. After independence the government of India used the site for housing government employees. But after that for almost forty years, the Haveli’s condition got deteriorated and finally, the government handed it to West zone cultural center. West zone cultural center then renovated the Haveli into a museum. 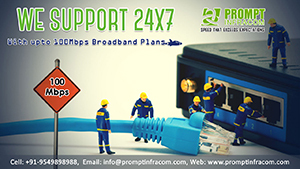 To know more about City Palace, click here. The monsoon palace, also called Sajjangarh palace is a hilltop palace at a distance of around 7 km from the city. It was built by Maharana Sajjan Singh in the year 1884. It is said that Maharana Sajjan Singh built it at the top of the hill so that he can see his ancestral home which was Chittaurgarh. 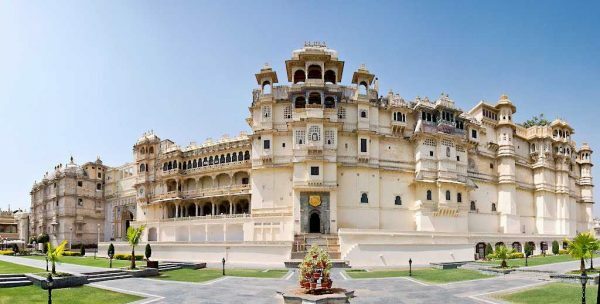 It was previously owned by the royal family of Mewar and is now owned by the forest department of the government of Rajasthan. 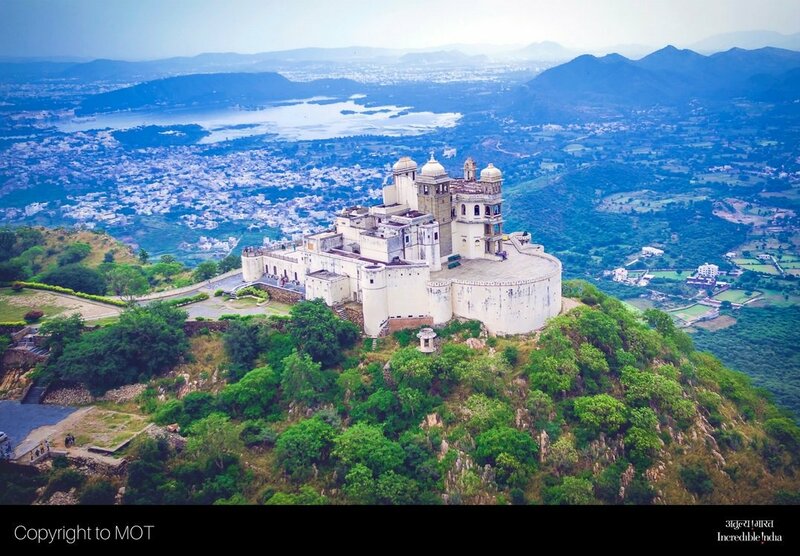 The beautiful palace gives you a mind-blowing view of the sunset and is supposedly called monsoon palace because it seems like the palace is floating in the heaven during Monsoon. 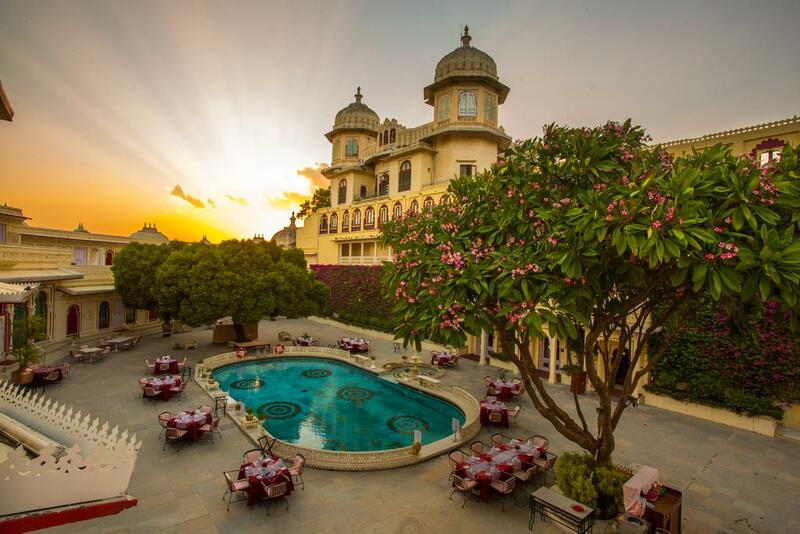 To know more about Sajjangarh Palace, click here. Moti Magri or pearl hill is a memorial of the great Rajput hero Maharana Pratap. 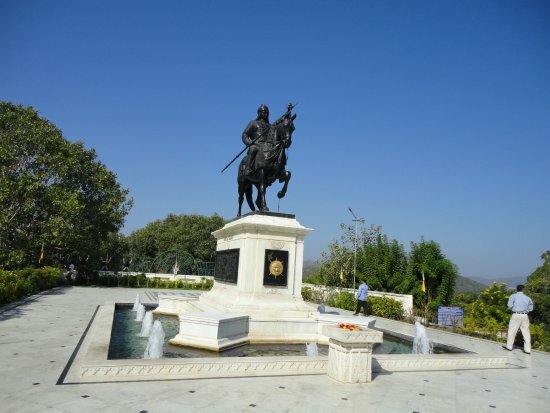 There is a bronze statue of Maharana Pratap on the top of the hill with his favorite horse, Chetak. It is said that Chetak was a very brave horse who climbed upon an elephant in the battle of Haldighati which crippled one of his legs. But when he thought that his master needs to be rescued from the battle, he landed him in a safe spot away from the battle with his crippled legs. He also jumped upon a stream while this journey and this led him towards his death. Along with the gardens, smaarak, and a magnificent view, Moti Magri has a hall of heroes which consists of 20 large paintings on the history of Mewar and modals of Chittaurgarh and Haldighati battle. To know more about the brave horse of Maharana Pratap, Chetak, click here. 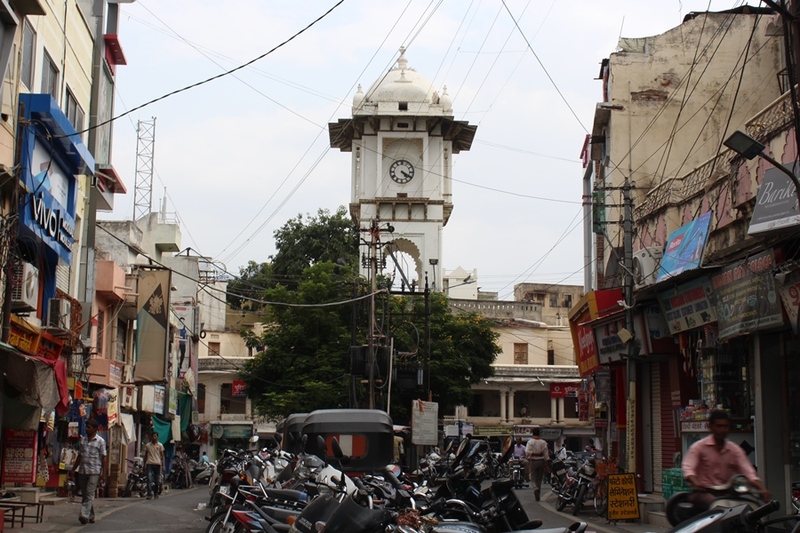 Ghanta Ghar which is also called clock tower was built around 130 years back by Maharana Sajjan Singh. The reason for it being built was a conflict between Bohra and Mahajan religion. Then Maharana made them pay 5000 Rs. Each as a penalty and this money was used to build the Ghanta Ghar. That is the reason why Ghanta Ghar is called to be made from the sum of ‘Nazrana and Jhurmana’ (Penalties and punishments). The clock used in it was imported from London. The architecture of the clock is unique and splendid. The length of Ghanta Ghar is around 50 feet. It was city’s first public watch. Know more about Ghanta Ghar here. Sas Bahu or if we refer it to its full name which is Sahastra Bahu is a temple of Lord Vishnu. It is at a distance of 17 km from the city in Nagda. Sas Bahu temple was built back in 10th century AD. Nagda was once an important city for Mewar. It was probably the capital of some Mewar ruler back then. The temple is surrounded by Bagela Lake. Although the temple is now in ruins, one can easily see the magnificent architecture and the beautiful carvings on the walls of the temple. To know more about Sas Bahu temple, click here. 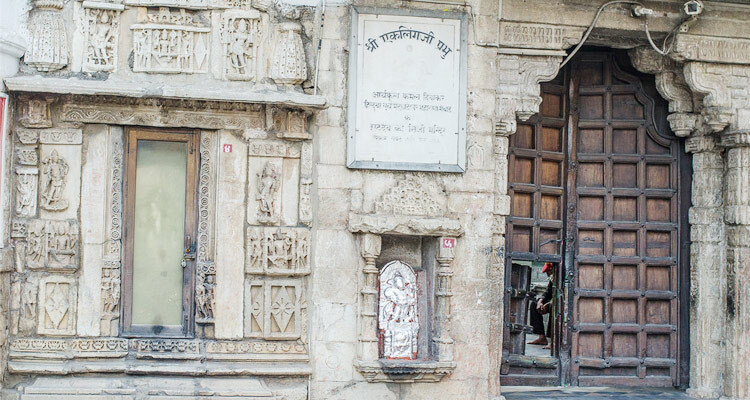 Eklingji temple was built by Bappa Rawal who was also the founder of Sisodia clan in Mewar. The original temple was built by Bappa Rawal but it has been renovated and refurbished by the successive rulers. It is said that Bappa Rawal was a firm devotee of Lord Vishnu and that he dedicated his entire kingdom in the feet of the deity. He proclaimed that the kingdom is of the deity and he is ruling it on behalf of the deity. The temple was attacked by the enemies several times but it got rebuilt and reconstructed repeatedly. To know more about Eklingji temple, click here. Jag Mandir Palace is a palace built amidst the Lake Pichola on an island. It was earlier called Gul Mahal. 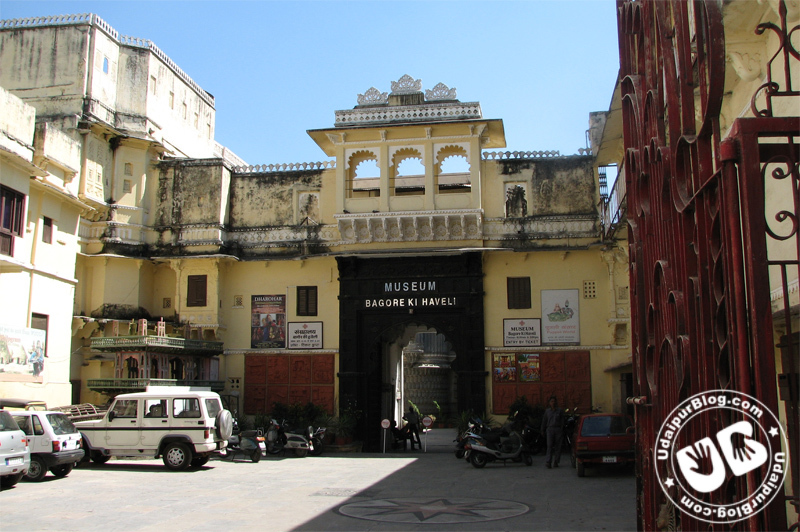 The history of Jag Mandir Palace is dated back to the year 1623. Maharana Karan Singh (1605-1627) extended a helping hand to protect Emperor Shahjahan (before he became the Mughal emperor) from the danger of getting thawed in his campaign. Initially, he was kept safe in city palace along with his wife Mumtaz Mahal and his two children Prince Aurangzeb and Prince Dara. After that, they were shifted to safe refuge, Gul Mahal. Gul Mahal was specially built for Shahjahan. It is said that the inspiration for one of the wonders of the world, Taj Mahal, came from Gul Mahal in Shahjahan’s mind. The palace is now converted into a resort. To know more about the Palace, Click here. The palace was constructed by Fateh Singh who ruled Mewar from 1885 to 1935. The purpose of the palace back then was to serve the esteemed guests of the royal family during any royal functions. And the purpose has still not changed much. 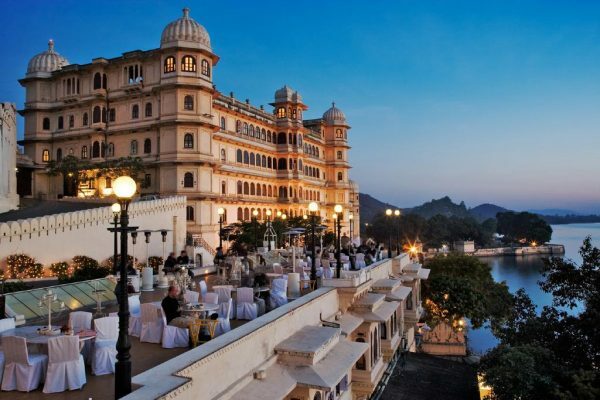 It is now converted into a heritage hotel where renowned people stay during their time in Udaipur. 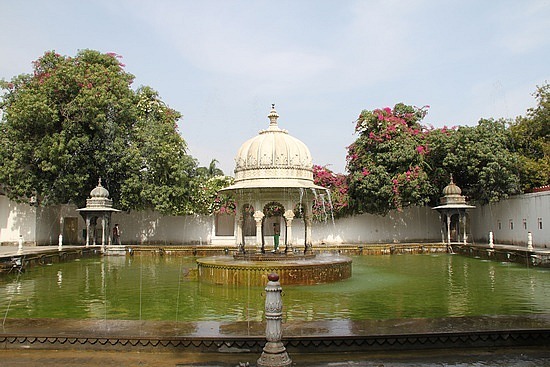 You may also want to read Palaces and forts in Udaipur. Lake Palace was built under the direction of Maharana Jagat Singh during his ruling time from 1743 to 1746. It was initially called Jagat Niwas or Jan Niwas. Lake Palace was built as a winter palace by Jagat Niwas, however later on the successive rulers used it as a summer resort by holding their durbars in its courtyard. Now, it is converted into a luxury hotel where renowned guests and celebrities stay during their visit to Udaipur. 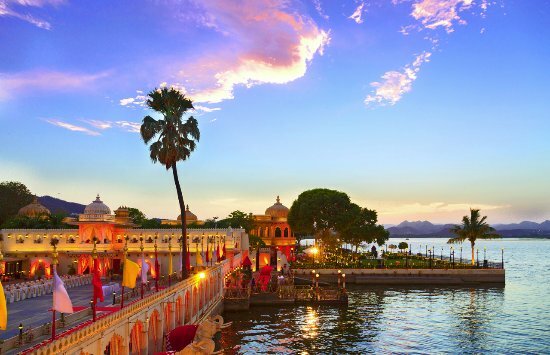 To know more about Lake Palace, click here. The work of Shiv Niwas Palace was started by Maharana Sajjan Shambhu Singh and finished by his successor Maharana Fateh Singh at the beginning of 20th century. Initially, it was the royal guesthouse for all the royal guests coming to visit the Maharanas. In those times it hosted a number of royal gatherings which includes George V of the United Kingdom in 1905, and Edward the Prince of Wales. 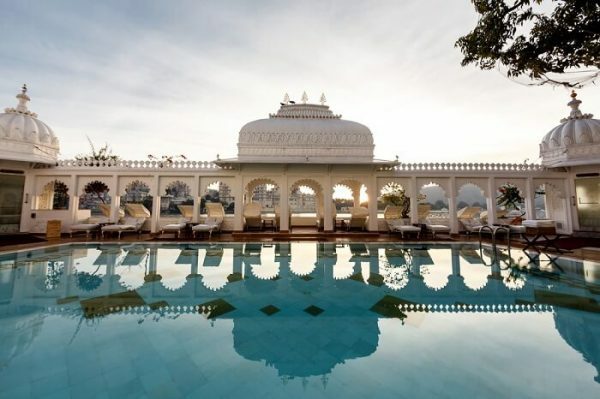 But later it became difficult for the royal family to afford the cost of large number of royal residencies that it owned and so along with the Lake Palace, they decided to convert it into an income-generating hotel. 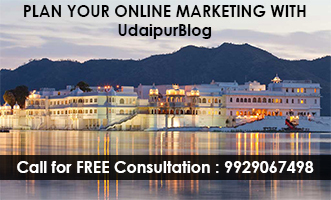 You may also want to read A list of the Best Hotels and Resorts of Udaipur. Mewar has always been rich when it comes to its history and culture. While most of us knew some of these places and their history behind, some of these were quite new for us, isn’t it? If you have any feedback regarding the article, you can either share it with us in the comment section below or write to me at juhee@udaipurblog.com. Wow, this is an awesome article 👌It’s great to know more about the amazing city we live in. Thanks Juhi for writing and UB for sharing it.